Observed at Arusha National Park, Tanzania. December 2013. From Wikipedia: The eyes are pale and the bill is on the large side for a weaver. Unlike many weavers, it has the same plumage all year. The adult male is yellow with black throat (edged rusty), face, and bill, and variable black mottling on the back. The adult female's upperparts are dull olive-gray with dusky brown streaks; the underparts are pale yellow, whiter on the belly and grayer on the flanks. The juvenile is similar but duller. The song is variable; one version is transcribed as "pew…pew…tew, chinkichi-chewchew-skerinkitsitew. Calls include harsh chatter at the nest and "a sharp tseep!" This species nests in colonies or occasionally singly. 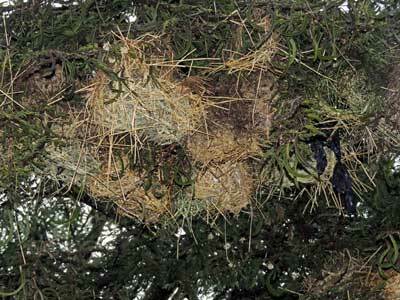 The nest, often woven in an acacia, is spherical with a short entrance tube opening sideways or downward. Many grass stems project sloppily, sometimes obscuring the shape. It nests in both the short rainy season and the middle of the long rainy season. 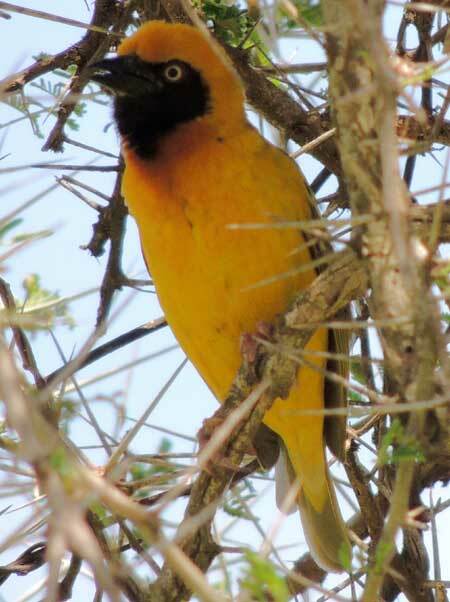 This bird, which is common in the Nairobi area and other highland areas, was named in honor of John Speke. In an acacia tree near Nakuru, Kenya, July 2015.